Home » Uncategorized » Overdue Thank You’s/We’re really doing it, we’re hiking the AT! Overdue Thank You’s/We’re really doing it, we’re hiking the AT! It was possible foreshadowing of our hiking pace to come: We left New Ulm, Minnesota around 5pm Wednesday last week and arrived to Panama City Beach, Florida a mere 24 hours later. 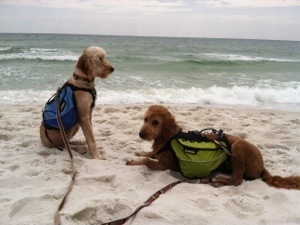 We were met by my generous Aunt Lola & Uncle Tom and had 3.5 days of beach, sunshine, and lots of food. Not just any food either – we’re talking homemade goodies & southern pound cake! It was a great mini vacation before all the hard work started this Wednesday. Before we even get to the details of the AT thus far there are some very important people that we must thank. Kelly & Gary Anderson, aka ‘The Event Center’ – thank you a million for hosting our final hoorah with our families before we took off! You both are far to generous and tolerant of our crazy gang. Thank you to our parents – Jeff & Betty/Lee & Rhonda. Thanks for loving us enough to advise us against following through on our crazy ideas but loving us and supporting us when we go and do it anyways. We thank you in advance for all you’ll do for us in the upcoming months as well! Our siblings, Braden thank you for the gear you contributed. 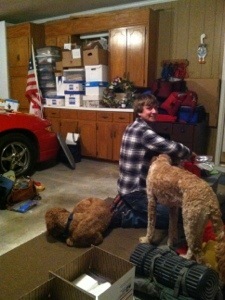 It has all been a tremendous help, and Brent says thank you for helping to shave Jack into a lion. Crystal & Trevor and Connie & Jeff – thank you for coming out to send us off, can’t wait for the follow up party at the end! You have your work cut out as well these upcoming months, Brent wants Lawson & Ronin catching and throwing by the time he’s back! Taylor, thank you for cutting my hair so short and manageable, and for coming out to groom Jack into looking like a lion in the same day – you rock! Thank you to my family who insisted on celebrating my May birthday early – got to have cupcakes twice before we left! Grandma Bonnie, it’s wonderful to know we have you to turn to if we decide against this all. No shame, right? Thanks to everyone at Fredin Bros, for a fun send off, we’re interested to hear if everyone placed their bets on how far we’ll make it. Last and certainly not least, Avery, thank you for voluntarily getting in the car with us and our dogs from Enterprise, AL to Atlanta, GA and making sure my car got back safely. Now, for the trail update. We’ve been at it three days now, a wonderful guy by the name of Ron Brown (check out his Facebook page for a photo of Jack: Ron’s Appalachian Trail Shuttle) picked us up at 6am on Wednesday in Atlanta. 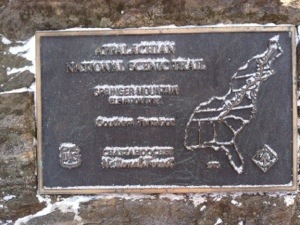 We traveled two hours to Big Stamp Gap where we were a mile away from the start of the AT, Springer Mountain. That whole morning the goal we had set for ourselves weighed heavy on our minds and although adrenaline was high, the car ride was often silent. 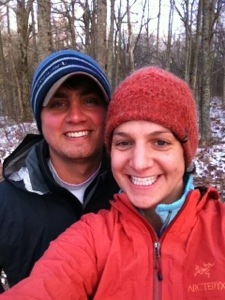 We started our AT thru-hike at 9:23 am from a snow covered Springer Mountain. One of the first people we met was a 70 year old woman from Chattanooga, TN. She has been hiking the AT since 1977, did 800 miles of it last year, and hoping to do the whole thing this year post knee surgery. Talk about inspiration. Georgia being one of the toughest stretches (everyone has their own definition of tough) we didn’t know exactly what to expect of ourselves. The terrain is a constant battle of up and down, and when you’re adjusting to carrying a full pack it can be quite daunting. 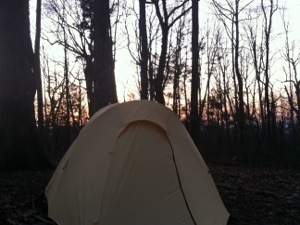 That first night we set up camp at Horse Gap (10.5 miles!) so exhausted from the previous nights of preparation we slept on a downhill slope and called it a night by 7pm. Alexis started off the trek voiceless too, and it’s been slowly coming back. Day two we couldn’t have asked for better weather! That was our motivation the whole day through to keep going-we gotten bits of the weather forecast that lay ahead and we know some days we won’t be so lucky. We set up camp near Dockery Lake Trail (23.8 miles, 13.5 for the day!). Perfect spot – we made green chile chicken & rice burritos that hit the spot as we watched the sun set. Today our goal was to get through the Jarrard Gap to Neels Gap stretch because no camping without a bear canister is permitted. That stretch includes quite the climb to Blood Mountain, which is worth it alone for the views. Heavy hiking traffic throughout – both long term backpackers and just those out for a day hike. The boys get quite the attention in crowds, but they’re still getting used to their surroundings. They think those hiking/trekking poles used by some are pretty scary. When we approached Neels Gap we were met by traffic, a gang of motorcycles, a hostel, showers, laundry, pop machines, and an outdoor store. Quite the contrast from the trail, and we both took advantage of what is now a luxury of going to the bathroom in a toilet and continued on our way. Tonight, we just enjoyed a rehydrated meal of bow tie pasta, beans, and ground turkey known as ‘Cowboy Pasta’, then crawled into the tent just as it started to sprinkle outside. The bear bags are hung – we have to hang one for our things and another for the dogs packs. We hope this update finds everyone well! Happy Trails. Hope the bears leave you alone. Oh and Lawson is already catching and throwing so my job is done! Love you guys! It is great to hear from you and your pups look pretty adorable as do you. Keep on keeping on – I’m rootin for you!! Alexis and Brent: LOVE following your blog, makes me feel like I am there with you (kinda). Couldn’t be prouder! Happy Easter! Let’s see, beer or Peeps, you know what I would choose! We love hearing all about your adventure. Keep smiling and give Jack & Lewis big hugs.